In Nobel Prize winner John Steinbeck�s beautifully rendered depictions of small yet fateful moments that transform ordinary lives, these twelve early stories introduce both the subject and style of artistic expression that recur in the most important works of his career. Each of these self-contained stories is linked to the others by the presence of the Munroes, a family whose misguided behavior and lack of sensitivity precipitate disasters and tragedies. As the individual dramas unfold, Steinbeck reveals the self-deceptions, intellectual limitations, and emotional vulnerabilities that shape the characters� reactions and gradually erode the harmony and dreams that once formed the foundation of the community. This edition includes an introduction and notes by James Nagel. Before I created�Good Books And Good Wine, I was a still the huge reader that I am today. My tastes, however, were very different from what they are now. I used to read a lot of literary fiction and classics and a whole lot less young adult. One of my favorite authors was and still is John Steinbeck. I loved his imagery, I loved how readable his writing was, and I loved how sad his books made me. 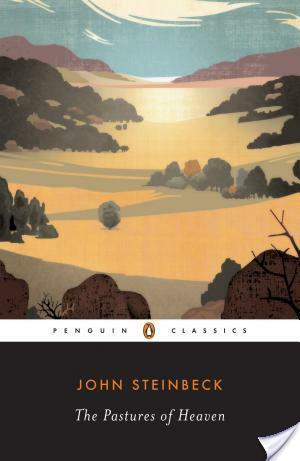 A year ago, I was offered an audiobook review copy of�The Pastures Of Heaven by John Steinbeck and so, I immediately took it because of my love for Steinbeck. Yet, other books popped up and so,�The Pastures Of Heaven essentially sat on my queue and sat and sat. Recently, I was at a loss for which audiobook to start, so I just went with the one that had been on my queue for review the longest –�The Pastures Of Heaven. The Pastures Of Heaven is comprised of twelve short stories that are connected quite loosely centering around a town in the Salinas Valley in California called Las Pasturas Del Cielo, aka the Pastures of Heaven. The stories go from how the valley was settled to a story about a man who fakes like he’s rich to a story about a boy who has diminished mental faculties and is thus violent to a story about tourists riding through the valley on a bus and pondering what life must be like for people in the Pastures Of Heaven. It’s another sad and depressing book with pathos and with some real tragedy. Really, it’s a gorgeous book. How Did I Like This Book Compared To Steinbeck’s Other Books? You guys know that I love Steinbeck’s books — my favorites are�The Grapes Of Wrath�and even more than that�East Of Eden�(favorite scene is when the men are studying this Bible verse and interpret the meaning of the Hebrew word ‘Timshel’. I just, I love that whole scene and the themes and what it evokes. Honestly,�The Pastures Of Heaven is not my favorite of Steinbeck’s books. It is still good with interesting images and scenes and what they evoke. However, I just didn’t feel the connection or like my mind was totally blown. Perhaps if I had read this before those two books, I might feel like my mind has been blown by the imagery. And yes, this book is also kind of sad too like all his other books. Honestly, I think I might have liked this book better had I read an actual physical version of it instead of listening to it. Sean Runnette is the narrator and he does an okay job. However, it took me awhile to warm up to his voice. I mean, I did not immediately like it off that bat. He has a sort of accent and I don’t know how to describe it — I just don’t know that I like it for this book. In all honesty, I think that if Frank Muller wasn’t dead, he would have been the perfect narrator for this book. I kind of feel like The Pastures Of Heaven needs a narrator who has a more grisled voice with a bit of pathos in it. That stated, this was a really quick listen, but I don’t know, I just did not love the audio portion. This is what I could find when googling Small Town GIFs and I have to say that’s what it feels like to get back into a John Steinbeck book after so many years. John Steinbeck is my favorite of all time, forever, and The Grapes of Wrath is my favorite book of all time, forever. However, The Pastures of Heaven is my favorite of his short novels. Truthfully, as much as I love audiobooks, I’ve been scared to listen to his books on audio because this author uses such fantastic and vivid descriptions that just work so well when I read them for myself and sometimes the classics do not have the perfect voice actors to convey things the way that I want them to (sounds selfish, right?). So I’m really glad that I read this! I distinctly remember The Pastures of Heaven being so vivid in my own mind when I read it in print, so I wonder if print may be better for this particular book. I’m so sorry that this wasn’t a 5-star, OMG YES, high-fives all over the place book for you, April! BUT even so, I know that you know Steinbeck is amazing and you have read others and you will read others by him. You know that feeling you get when you love an author so much or a book so much and you just want others to love him/her/it too? That’s how I always feel about this guy. Every time.